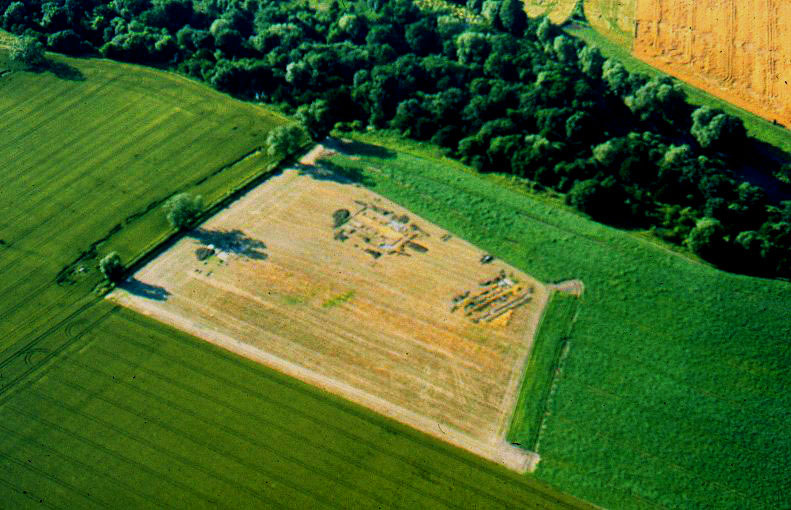 In the early 1990’s a fieldwork group was set up within the Teesside Archaeological Society, led by myself with a view to investigating the apparent absence of Romanisation in the Tees Valley after the 2nd century. The project focused on revisiting archive material, and approaching those carrying out funded and unfunded aerial photography with a view to reassessing those images that had been archived under the catchalls of Iron Age and Medieval enclosures, and field systems. Two particular sites were brought to our attention by Blaise Vyner who had been conducting funded AP surveys of local sites for many years, for the official archives. He postulated a ‘cottage house’ early form of villa feature at at the top of the scarp above the river at Dalton on Tees, 5km south of Darlington. Additionally a small enclosure at Hardstones Farm, Long Newton 5km west of Stockton on Tees, positioned on the eastern end of the ridge on which the postulated alignment of Cades Road (Margary 80A) traverses the Tees valley at the other end, some 1km to the west. The Dalton site was visited, where it was immediately apparent that the structure was in the cultivation horizon with heavy concentrations of ploughed up stone in the field margins on the scarp slope, together with plaster, tile and other materials present in the top soil. A series of field-walking exercises working to a 20m grid were carried out over the course of 1994/95 between crop cycles, and a clear plan of the probable limitations of the Roman site were gained from the plotted pottery scatters. it was decided that in 1997 after the harvest, we would carry out limited excavation down to the last occupation surface to establish the level of plough damage, and record what we could before they were subject to further damage or destruction. It soon became apparent that the task exceeded the window available, especially considering we were relying on 100% hand excavation. We contacted Henry Owen-John of English Heritage, who after visiting the site kindly agreed to provide the funds to compensate the farmer for taking the area we had identified out of production for a full year, just in time, as the rest of the field was deep ploughed for potatoes. Our project design was simply to expose and record as much of the last occupation layers as was possible, of what we thought at this stage was a single winged corridor villa some 30m x 18m. We worked through the autumn and winter of 1997/8, and the spring and summer of 1998, working every weekend whatever the weather. before handing the site back to the farmer Mr John Ramsden and his lovely wife Anne. We eventually exposed two large buildings, Building A the winged corridor building 30m x 18m to the east. The principle structure facing south was Building B, a winged aisled building , probably two storeys of exactly the same 30m x 18m dimensions as Building A, , together with a third range Building C some 20m x 10m to the west, and additionally a well. After magnetic and resistivity surveys, we were presented with a huge four ditch system running between the two primary buildings with the two principal ditches 7m wide. We decided to section one of the ditches to collect a stratified deposit, and recovered a wide range of stratified dateable material spanning the 1st century to the end of of the 4th, We also excavated the well we found adjacent to Building C.
An area including all the buildings was recommended for scheduling and was duly scheduled in 2003. This classic villa complex at a stroke moves the extent of the developed villa landscape north 40km from the Vale of Pickering to the banks of the Tees, and has created a re-evaluation by others of other sites categorised as discussed above, as well as encouraging others to actually look for Romanisation. This has resulted in another villa on the banks of the Tees at Ingleby Barwick 14km east of Dalton, and another villa at Brotton in East Cleveland to add to the existing villa at Holme House, Piercebridge, which was formally thought to be linked to Piercebridge, rather than being a standalone villa. Other sites are also under research. The full excavation and specialist reports for the Dalton on Tees Villa will shortly be published on this site within the Open Archive, and soft copies will be provided for the national records and other interested parties. There will be no printed version. The excavated material is under archive at Tees Archaeology.